[S1260] George E. McCracken, "A Hartford Miscellany: Howard, Stone, Adsit–Edgett", The American Genealogist 36 (1960): 33-35, using especially the will of Ezekiel Rogers to determine that his sister (though her given name is not known) was the wife of John Stone and mother of Samuel Stone and his siblings. [S1262] Sidney Lee, editor, Dictionary of American Biography (First Series) (London: Smith, Elder and Co., 1885–1900), XLIX:138. Hereinafter cited as Dictionary of American Biography. [S1261] Truman Lewis Stone, Book II of The Family of John Stone (Buffalo, N. Y.: Charles Wells Moulton, 1898), pp. 35-36. [S1263] Henry F. Waters, Genealogical Gleanings in England (Boston: New England Historic Genealogical Society, unknown publish date), pp. 211-212, originally published in NEHGR 41:163 (Apr 1887). The inscription on the tombstone of Richard Rogers of Wethersfield (see Col. Chester's Life of John Rogers, pp. 239, 240) shows that he died 21 April, 1618, in the sixty-eighth year of his age, and was born therefore about A.D. 1551. The following is a very concise abstract of his will, which was published in full in the October number of the Register for 1863 (vol. xvii. p. 326). 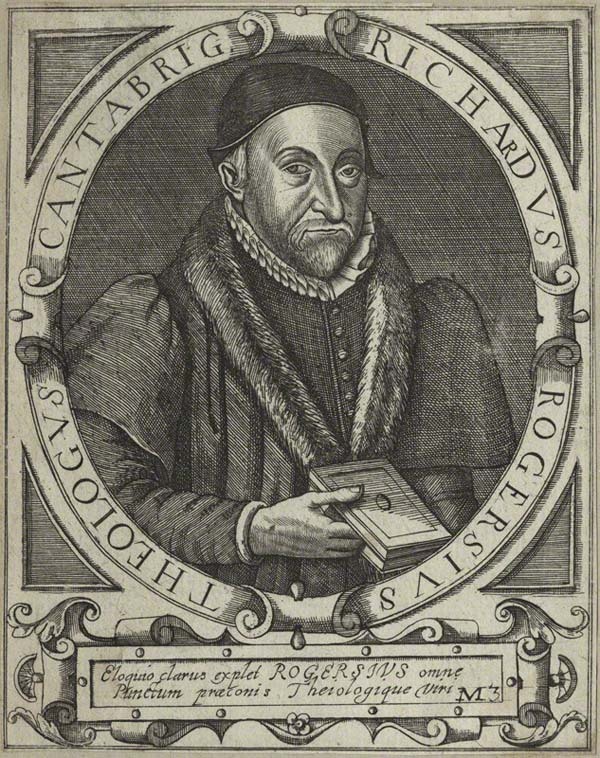 Richard Rogers of Wethersfied, Essex, preacher, 16 April 1618, proved 30 April 1618. He mentions John Clarke, a neighbor at the brook, Samuell Waight, a son in law, Walter Wiltsheir and Jeremy Boozy. To wife Susan all such goods and household stuff as were hers before I married her. I give to my son Danyell my best cloak &c. I give to my son Ezekiell all my Latin and Hebrew and Greek books, but if his brother have not St Austin's Works, I give them him; other books written by myself and all my written lectures and papers I give to sons Danyell and Ezekiell "and to my Cosen Rogers of Dedham" &c. Twenty pounds, out of remainder of my annuities, to wife, and whatsoever shall remain I give it among all my six children. Of the ninescore pounds and twenty marks which Allen Montjoy gent owes me I give the said ninescore pounds to sons Daniell and Ezekiell and the twenty marks to my daughter Hasselder's children which she had by her husband now living. Daughter Hasseler again mentioned. To my wife's children forty shillings apiece. To my sister Mary Duckfield's three daughters and her son John forty shillings apiece. To my kinswoman Mary Smallwood twenty shillings &c. To Cousin Daniel Duckfield twenty shillings. My meadow in Wethersfield lying between the Lords meadow and John Clarke's. Goodman Parker's daughter, the widow Barnard. My executors to be Cousin Mr John Wright esq. of Romford, in Essex, Susan, my wife, and Francis Longe, my son in law. My brother Cooke and my son Makin to be overseers. Wit: John Clarke Samuell Wayte. B. Hamer 311, Consistory Court of London.
. Hereinafter cited as Genealogical Gleanings in England. [S1262] Sidney Lee, Dictionary of American Biography, p. 138. [S794] The Essex Institute, compiler, Vital Records of Rowley Massachusetts to the End of the Year 1849, two volumes (Salem, Mass. : The Essex Institute, 1928), I:515; "ROGERS (Rogres), Ezekiel, Rev., first minister of Rowley [b. 1590 at Wethersfield, Eng., a minister in Rowley, Yorkshire, d. Rowley, Mass. G. R. 1], Jan. 23, 1660."